The city of Zhanjiang is famous for the sale of dog meat. Around a third of the restaurants in this city sell it. I arrived in Zhanjiang when it was dark. Many people were walking the streets and dining in street restaurants. Down one of these streets, I located several restaurants selling dog meat. 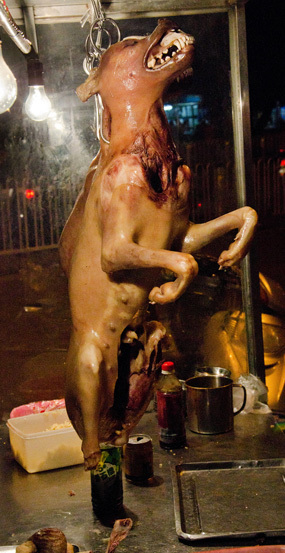 At the front of the restaurants were stalls with the corpses of dead dogs on. The throats of the dogs were covered in large lateral gashes. The meat they swallowed certainly didn’t look any different than the meat of other animals, like pigs or cows. The dogs had terrified facial expressions and, because their bodies had been boiled in water, their skin had shrunk, which meant that their teeth were showing. Restaurant customers eating dog meat who saw me taking photographs started smiling and making friendly gestures. They asked to be photographed eating dog meat and appeared proud of their culinary choice. These people eating dog meat are just the same as someone in Europe eating a steak. The meat they swallowed certainly didn’t look any different than the meat of other animals, like pigs or cows; it becomes dark after being cooked, and you can recognise what it’s made of: muscles, tendons, bones… It is the flesh of a sentient being who wanted to live life in peace and was killed for the futile reason that someone liked the taste of his or her body. We enquired at a restaurant where the killed dogs came from and were told (by a waitress) that they came from another province. She said that the dogs were from the streets, rather than farms. Another waitress told us that the dogs came more precisely from Hunan or Sichuan. The dogs are apparently killed there, and the fresh meat is then sent to Zhanjiang. The selling price of the dog meat was 30 or 40 RMB (3 or 4 euros) per 500g – which is relatively more expensive than meat that is sold from other types of animals.